In just a few hours I will leave my husband and three children for five days and go half way around the world to Budapest, which is indeed a very very far away place for a worrier like me who imagines every possible worst-case scenario. I have been touched today by two fathers: one is Eric, who has been so great in encouraging me to attend the Lausanne leadership conference and been willing to do whatever it will take (which is quite a lot) to manage the three children and our lives while I am gone. This morning at breakfast I asked Owen and Annie why they love their Daddy. Owen said, “Because he’s special. And he plays with me.” I thought how simple but profound those words are — Eric is really special as a Dad. 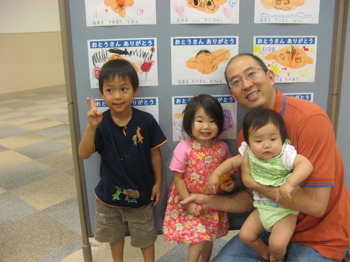 He will spend hours on the floor with the kids, doing whatever it is that they love doing. And doing it with such abandonment. I can’t do that — I am always thinking about what needs to happen next. Here’s to a great Dad! Tonight, we went to our local mall’s food court for dinner. We had to take the elevator down to the first floor after dinner because we had Olivia in a cart… and happened by the large all-purpose room in the mall. 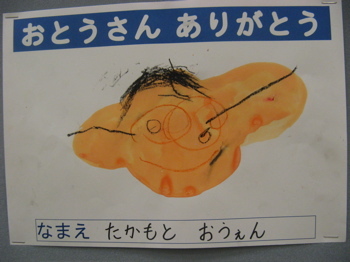 We had never gone in before, but as we walked by we saw… pictures that children from around Sanda had drawn of their dads. 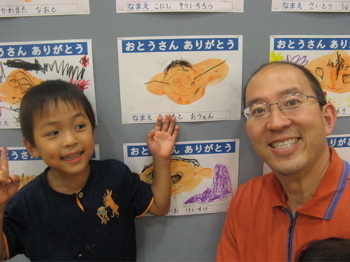 We went in and saw a few by Owen’s classmates…then we saw Owen’s first artwork – his version of his very special Dad. I was so touched by this special surprise. The photos say it all. And the second Father who touched me today spoke to me at our house church this morning about my fears of leaving: “But the Lord is faithful; he will strengthen you and guard you from the evil one. … May the Lord direct your hearts to the love of God and to the steadfastness of Christ.” (2 Thess. 3: 3, 5). I really have had a lot of apprehension about this trip. But it vanished this morning as our Father brought me such comfort from the REALITY of abiding. I can trust Him with my family. I can trust that He will give me strength for each day (and Eric as well). And I need to continue to choose this sense of abiding in His love. As I read the last part quoted above, I had an image of the first time that I went to this new mall in our town. There were a number of entrances and exits, and a lot of cars also trying to figure out what to do. But thankfully the mall had hired parking attendants, who waved me down when I almost drove in the exit. With arms flailing in the air, waving beacons, this attendant directed me into the correct entrance lane and into a parking spot. So it is with our Father. When i start to let my mind panic and go in the wrong direction, I need to come back to the waiting and waving One who is seeking to direct my mind and heart into the love of the Father. What a great place to park…. We would cherish your prayers in these days to come. I will be gone from Monday morning until Saturday morning, Japan time. If possible, I will try and post something from Budapest…. Oh, Sue, we will be praying for your trip and for your family while you are gone. HAPPY FATHER’S DAY, ERIC!!! We KNOW you are an awesome dad!! We have seen you in action! 🙂 And our Father in Heaven is even more wonderful and awesome than we can imagine. He will watch over your family while you are gone. And the best part will be returning to sweet little hugs and kisses and an even more appreciative husband!! 😉 We will keep you in our prayers for a really meaningful time in Budapest!